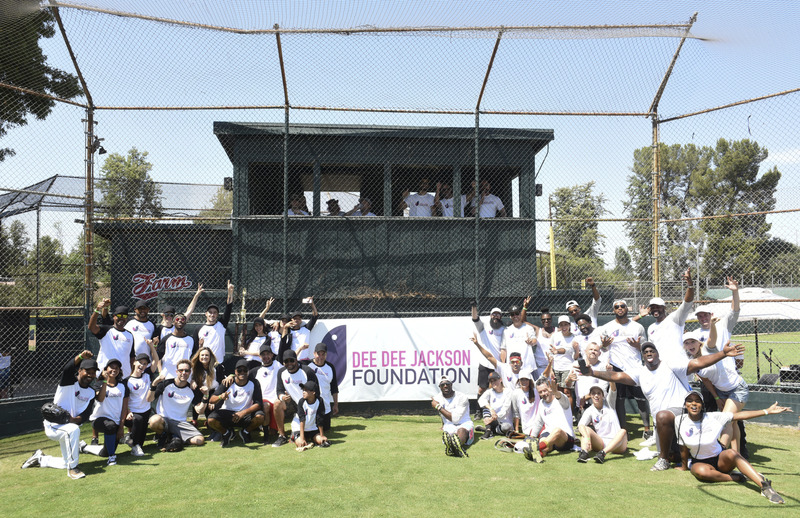 T’was a Sunday well spent with one iconic family for a great cause at the brilliant Dee Dee Jackson Foundation’s Celebrity Softball Game that took place on July 29, 2018 in Encino, California. A countless amount of spectacular celebrities gathered together and said batter up!! as they showed their support towards the inspiring and life-changing organization. The Dee Dee Jackson Foundation works endlessly to help youth recover from loss in their lives. The magnificent foundation honors the late Dee Dee Jackson, who dedicated her life to helping others and making a positive impact in the lives of many. The Jackson family including Tito Jackson, TJ Jackson, Taj Jackson, Taryll Jackson and Prince Jackson as well as other celebrities including UFC legend Chuck Liddell, musician Kendall Schmidt, Terrell Owens, Ser’Darius Blain, Da’Vinchi and many more enjoyed taking a swing at the ball and joining in on an unforgettable day for a remarkable foundation. The event was held in honor of the one and only, Joe Jackson. All celebrity attendees had a total blast playing ball under the sun. The Jackson family’s team consisting of TJ Jackson, Taj Jackson, Taryll Jackson and Prince Jackson had a triumphant win with a close game of 10-7. Katherine Jackson was also in attendance to cheer on her family’s terrific win. It truly was a special day for everyone – from the incredible celebrities who came out to support this wonderful event to all of the attendees who were able to meet and greet with a legendary family and the many stars who attended. Check out some more pictures below from the Dee Dee Jackson Foundation’s Celebrity Softball Game! Previous Article: Meghan Trainor And Lauv Set To Perform At The 2018 Teen Choice Awards! Next VIPAccessEXCLUSIVE: The Phenomenal Adam McArthur Talks All About “Star Vs The Forces Of Evil,” Martial Arts And Answers Fan Questions In His Interview With Alexisjoyvipaccess!